Extension ladders consist of a traditional runged ladder with one or two additional sliding sections, known as extensions. These can be extended to increase the height of the ladder, then secured in place with locking clamps to give a stable piece of equipment perfectly suited to the job in hand. This makes them a particularly flexible choice for the user who needs to perform a range of jobs at varying heights as there is no need to use multiple ladders, saving time, effort and money. For the user working alone only needing to transport and erect one piece of equipment is less tiring and more efficient and the outlay on is equipment is greatly reduced. Extension ladders are very useful for jobs at significant height such as clearing gutters, cleaning or decorating upper storey features or external repair jobs. There are several points to consider before purchasing an extension ladder to be sure you are getting the best quality for your money. As quality usually means safety none of these should be ignored, especially if working alone. Ladder materials – Aluminium is always the best choice for an extension ladder. It is lightweight and hardwearing and not prone to corrosion or rusting like other materials, making it a perfect choice for outdoor jobs. Fibreglass extension ladders can be brittle and prone to breaking when exposed to stress or extreme cold, if this happens during use the consequences could be disastrous. Wooden ladders need to be regularly weatherproofed and can be prone to splintering and wearing, making them less safe. The lightweight nature of Aluminium also makes it very easy to transport and erect, especially if working alone. Cost – As extension ladders can be adjusted to the required height, only one is needed instead of several ladders of different heights. Obviously, only having to purchase one piece of equipment is always going to be more cost effective and once purchased it can be used for many different projects in the future. Certification – Not all suppliers disclose full safety information on their products. It is always worth checking that your extension ladder has the EN 131 kitemark, or in the case of telescopic ladders the newer EN 131-6 standard specific to these models. This ensures that the ladder has been rigorously tested to conform to British and EU safety standards and when correctly used gives maximum user safety. Dimensions – Always make sure you have the correct height of ladder for the job in hand. When fully extended an extension ladder should always have at least a two rung overlap between sections to prevent bending in the middle and subsequent collapse and work should never be performed on the topmost two rungs of the ladder. As two and three section ladders are available, finding one that can that can be extended to the correct height without taking these risks is not difficult. It is also worth checking the width of the ladder to make sure it is as comfortable to use as possible and considering the use of a step platform for extended use. There are four main types of extending ladders to consider. Each has its own merits depending on the type of project to be undertaken and the height required. Two section extension ladders – These are a type of double extension ladder, consisting of a ladder and an internal sliding section that can be extended to the desired height then locked in place to give a secure, stable ladder. They should have an integral stabiliser bar at the base to give a wider point of contact with the ground for added stability. Superior models come with wrap around steel clamps and nylon restraint straps to provide the most secure connection between sections and to minimise bounce during use. These also prevent over extension so that the correct level of overlap between sections is ensured. Three section extension ladders – These are a triple extension ladder, comprising a ladder and two internal sliding extensions. Because of the extra extension these are the best choice for safe work at more extreme heights and have a similar construction to two section ladders. Again, the sections are extended to the required height and locked in place but the extra extension provides even greater length. When fully extended the ladder is locked in two places, giving a very sturdy construction. Coupled with a stabiliser bar and restraint straps this is the safest option for work at greater heights. Also, when the sections are all retracted the closed length is shorter, making this type of ladder easier to store and transport. Multi–purpose ladders – These have four sections connected by three sets of hinges and can be assembled in a wide variety of configurations. Each hinge has a locking mechanism lever that can be depressed to allow the hinge to open and will automatically lock when certain angles are reached. Among other configurations, this allows the ladder to be fully unfolded to make a standard straight ladder, folded in half to create adouble sided stepladder, assembled as a stair ladder that can stand on different height steps at the same time or assembled as a platform support. It is a good idea to look for a model with stabiliser bars at either end and platforms that lock in place for added stability. When folded, these are extremely compact and can be fitted into the boot of a car for transport or stored in a cupboard. Telescopic ladders – these are very compact when retracted as each section of the stile beneath a rung slots over the lower section, similar to a stack of paper cups. When deployed, the second lowest section is extended and clips into place at full extension. Further sections can then be extended until the required height is reached. To retract the ladder each section has two release buttons on the front of the rung and when these are depressed the section slides back over the one beneath. Superior modern models use a compressed air system to slow the retraction so that the user’s fingers are not trapped as the rung lowers into place and have indicators that show green when the section is extended and locked in place for added safety. While they have wide rubber feet it can be advisable to use a levelling mat on uneven or slippery surfaces for extra grip. 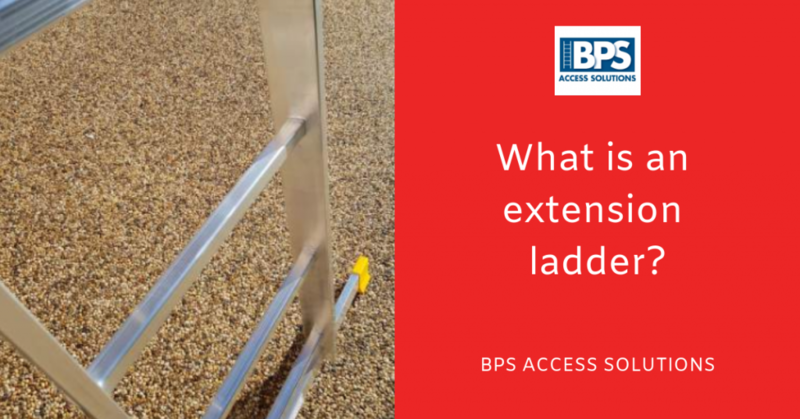 If an extension ladder is the right piece of equipment for your current project, BPS Access Solutions have everything you need. We have a variety of superior extension ladders for sale and a wide range of accessories to suit your needs. All of our products conform to the latest safety standards and represent the best value for money as we check our competitors’ prices daily to ensure value as well as quality. All products have free next day delivery and come with a lifetime guarantee as standard. For further information please visit our website or call our friendly expert team who will be happy to offer any help or suggestions you may need. PreviousWhat is the tallest stepladder you can buy? NextWhat are the best ladders for decorating stairs and landings?